We love the energy modern Celtic music brings. We love the history and culture of our tribal heritage. We hope to share it with you. 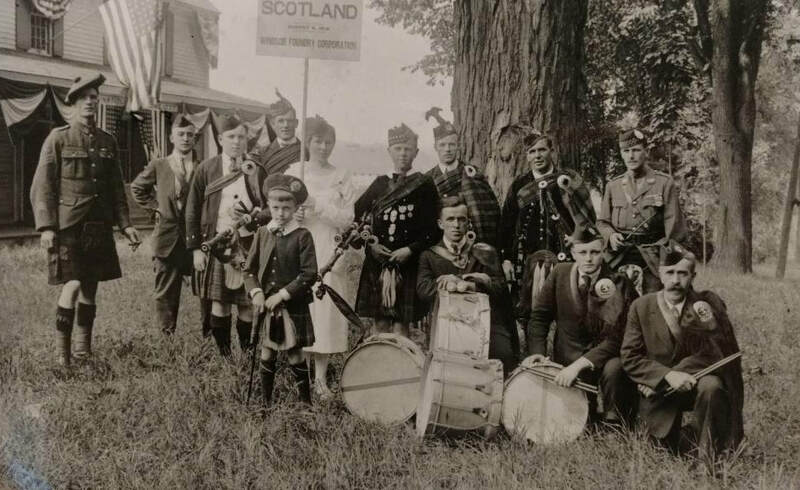 In between the days when Websters lived at Newton of Drumduan in Scotland and the formation of today's Drumduan Band, there was the Barre Kiltie Pipe Band, where Doug's great uncle Cecil Webster performed as a drummer in 1914 (second from right kneeling). Drumduan embraces modern Celtic music and fusion of dance with nontraditional choreography while promoting Celtic arts and culture. We let the music do its job to nurture healthy, connected, and fulfilled lifestyles that harken back to rich communities of our Scots ancestors, yet with a modern, exciting complexity that is all out fun. Celtic music hits the soul hard! Bagpipes, combined with a full set of drums, bass, and guitar, as well as fiddle, in harmony with pipes, creates one of the sweetest sounds know to person-kind. Carefully choreographed dancers accompanied by accomplished musicians provide visual stimuli that is unforgettable.